Prebiotics Help Probiotics Prebiotics are simply food for the probiotics (good bacteria) in your gut. EcoBloom: The Prebiotic Superstar- The easiest and most versatile way to add prebiotics to your diet is by using EcoBloom. 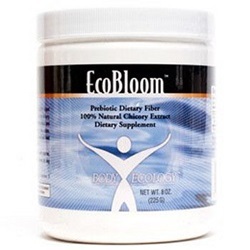 EcoBloom is a 100% natural powder chicory extract FrutaFit, Inulin (often called FOS). FOS is fructooligosaccharides, which serves as food for beneficial microflora. Take a look at all the benefits attributed to FOS as it helps promote the growth of the beneficial microflora that live inside you. You"ll soon see why EcoBloom is an important part of your healthy diet. You need food for your body, but your body and your intestines need food for the immune-boosting bacteria. Feed your beneficial bacteria with plenty prebiotic EcoBloom. Your pro-biotics will never go hungry again! Benefits: EcoBloom quickly boosts the growth of beneficial microflora. This suppresses the growth of pathogens, reduces toxins in the liver and colon and stimulates the immune system. Ingredients include: Ecobloom is 100% natural powder chicory extract FrutaFit, Inulin (often called FOS). FOS is fructooligosaccharides, which serves as food for beneficial microfloral. 8 ounces. prinkle EcoBloom into salad dressings, sauces or gravy and improve their texture and "mouthfeel". In beverages it adds body. Suggested Use Mix 1-3 scoops with kefir starter, salad dressings, cultured vegetable starter, or any hot or cold beverage.